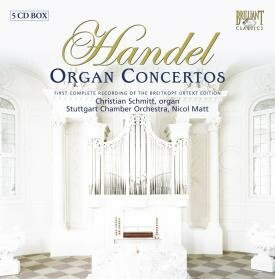 This is Brilliant�s second recording of the Handel organ concertos. Their first recording, using the Slovak Chamber Orchestra, had a rather old-fashioned air and was not quite complete. This new set, with the Stuttgart Chamber Orchestra, is based on the new Barenreiter Edition of the concerti edited by Ton Koopman. Organist, Christian Schmitt, uses Koopman�s editorial suggestions when performing the ad libitum passages which can be a problem in these works, particularly in the Opus 7 concertos. Whilst Handel was renowned in is lifetime as a virtuoso organist, his art was based on improvisation and he left no developed oeuvre of keyboard pieces which would give us an idea of his full capabilities as an organist. These concertos are actually theatre pieces, developed by Handel to support his oratorio performances. Handel brought in an organ to act as continuo in the oratorio choruses and developed the idea of an organ concerto as a way of adding extra novelty. At the oratorios, the audience could not rely on novelty and virtuoso display from the latest Italian singers so Handel�s performances on the organ were a sort of substitute. All of the concertos probably started out life with a pretty sketchy organ part, leaving Handel to invent at will and simply control the orchestra with a nod of the head or an extended trill on the organ. Luckily for us, from the 1730s, Handel started to develop more of an interest in publishing instrumental music as a way of disseminating his music. He helped John Walsh with the publication of the Opus 3 Concerti Grossi though he did not actually prepare them for publication. Then in 1738 Walsh published the Opus 4 organ concerti which Handel had prepared for publication. The organ parts are probably only the merest simulacrum of what he would have performed live but they are the nearest thing we have. More importantly, they are from Handel�s own hand. The concertos were not all written specially for the occasion; Handel was an expert at recycling material from other sources. Concerto no. 1 was first performed in �Alexander�s Feast� in 1736. No.2 was first performed in �Esther� in 1735. Its 1st movement derives from the motet �Silete Venti� and the 2nd from the Trio Sonata Op 2. Concerto no.3 was first performed during �Esther� in 1735 and is based on Trio Sonata Op. 2 No. 5. No.4 was first performed during �Athalia� in 1735 and the 1st movement is based on discarded chorus from �Alcina�. Concerto no.5 was first performed during �Deborah; 1735 and was adapted from the recorder sonata Op.1 no. 11. The 6th concerto was originally written as the Harp concerto included in �Alexander�s Feast� performed in 1736. It was only later adapted for organ. Here we hear it in both incarnations, Charlotte Balzereit providing a crisp, clear performance of the harp part. Walsh attempted to publish a second set of concertos in 1740 ?but Handel was too busy to work on them and only managed to deliver 2 concertos (the concerti in F major and A major). Walsh filled the set out with arrangements for organ of Handel�s concerti grossi. The Opus 7 concertos were not published until 1761 and were assembled by his assistant John Christoper Smith junior. It is here that the organist�s ingenuity is taxed as Smith and Walsh made no attempt to try and recreate what Handel would have played, so that the Opus 7 concertos are littered with ad libitum passages. Like the Opus 4 concertos, these Opus 7 concertos had a many and varied origin. Concerto no.1 was first performed during �L�Allegro� in 1740 and its 1st movement includes an independent pedal part. The 2nd concerto was first performed during �Samson� in 1743 and the last movement was based on rejected overture for �Samson�. Concerto no. 3 was first performed in 1751 during �Alexander�s Feast� and was Handel�s last orchestral work. The 4th concerto may have been performed during the �Occasional Oratorio� in 1746 but it may have been assembled by Smith after Handel�s death. The 5th concerto was first performed in 1750 during �Theodora� and the 6th was assembled by Smith. The final two concerti have a rather vague history, appearing in print for the first time in 1797 but we have no certain record of the occasions for which Handel wrote them. Handel�s organs were not large by our standard, though Opus 7 no. 1 does call for pedals. It must be borne in mind that his organ had to be transported into the theatre. This gives rise to a problem for performers as, if the organist is to play on an instrument similar to on Handel might have know, then they must be accompanied by similar scale orchestral forces. The orchestra plays Handel�s ritornello in a crisp, lively fashion. Their sound is that of a modern chamber orchestra, as it should be; but they give the sort of period-aware performance which is becoming reassuringly common and they provide good stylish accompaniment. These concertos give few occasions for the orchestra to really shine, but the Stuttgart Chamber Orchestra make the most of their opportunities. I was surprised to find a harpsichord playing continuo in the orchestral ritornello. I have always though of these works as concerti grossi, with the organ providing the concertino group. As such, it makes sense for the organist to provide the continuo as well and this is what usually happens. It provides for a continuity of sound which is lacking here. Schmitt plays in a rather legato style, rather than the crisp articulation favoured by Ton Koopman on his recording. But it does mean that in style, organ and orchestra match pretty well. Regarding volume and balance between soloist and orchestra I am less enthusiastic. His playing seems to be rather careful and reticent; his choice of registration is too often discreet and leaves the balance with the orchestra as being unsatisfactory. I can accept that in pieces like the first movement of the Opus 4, No. 5 concerto, Schmitt and Matt might deliberately intend the contrast in volume between the orchestra and organ, but in other places Schmitt just does not always sound like a soloist. What I wanted was much more of a feeling of display and bravura. If we turn to Ton Koopman�s recording, his organ sound no more powerful than Schmitt�s, but Koopman chooses registrations which make the organ solos stand out. Koopman also manages to avoid the toy musical box effects which afflict Schmitt�s performance in the first movement of the Opus 4, No.6 concerto. I was surprised to find that they had spread this set over 5 CDs. I would seem that it could easily have been fitted onto fewer discs, or perhaps we could have heard some of the Concerto Grosso arrangements from Walsh�s second set of concerti. The "Six Fugues or Voluntaries for the Organ or Harpsichord" were written between 1711 and 1718, the period when Handel was in Hanover and London. Walsh published them in 1735, probably encouraged to do so by the success of the organ concertos. Schmitt plays 4 of the fugues at the end of disc 5, the remaining 2 are used as ad libitum movements in the Concerto in F major HWV 295 and the Concerto in D minor HWV304. I give this set a cautious welcome; it has the advantage of completeness and uses the most recent edition of the concertos. But I find myself returning to earlier sets, such as the one by Ton Koopman, with a great deal of pleasure.